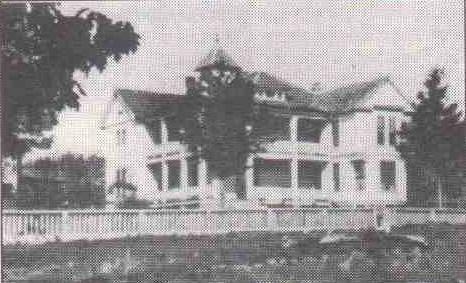 The land upon which Lesmeister Guesthouse stands was purchased February 24, 1902, by Henry Lesmeister, who proceeded to construct the building. Electricity didn’t come to Pocahontas until 1911, so Lesmeister’s building was originally lit only by its large east- and west-facing windows, and oil lamps. The streets in downtown Pocahontas were first paved in 1928. The land for the building was purchased from a larger plot of property in downtown Pocahontas that was purchased from Minnie Beauvais by Carl J. Roellin, June 4, 1894. Henry* Lesmeister and his wife Martha Whipperman Lesmeister had immigrated to America from Essen, Germany, first settling in Lexington, Kentucky, before moving in 1880 to Pocahontas with their son, Henry Jr. and their daughter Theresa Frances. *Lesmeister’s given name, in the Germany of his birth, was Heinrich, but they apparently anglicized it to Henry when he immigrated to America. Henry Jr. became a noted architect who designed the grandest buildings in downtown Pocahontas, including his father’s building that now houses Lesmeister Guesthouse. Henry Jr. also designed the roof on St. Paul the Apostle Catholic Church in Pocahontas, with its king trusses that carry the building’s roof without need for interior support posts. Henry Jr. also designed many buildings in nearby Jonesboro and as far away as Memphis, Tennessee. With time, young Theresa Frances Lesmeister became the bride of Hubert A. Peters, whose family had come to America from Aachen, Germany, settling first in Columbus, Ohio, before moving to Pocahontas in 1880. 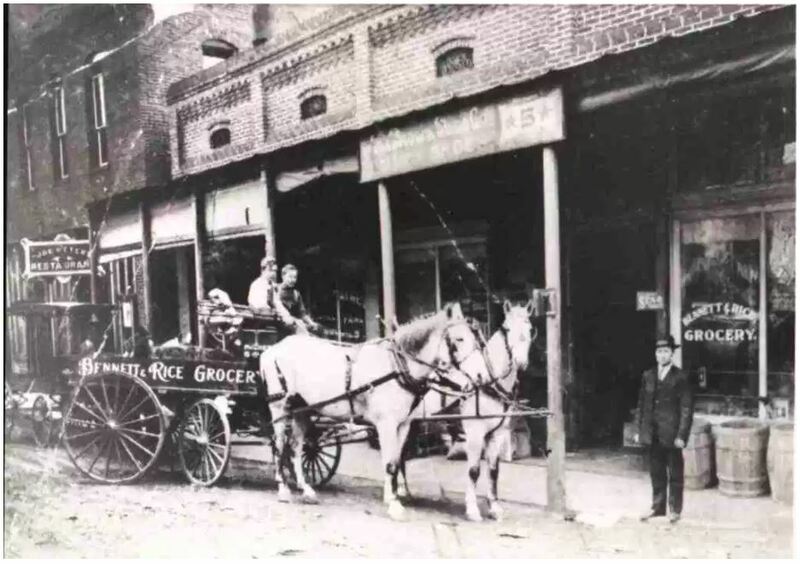 Initially, Peters opened Peters Grocery in the north half of the Lesmeister building, with Bennett and Rice Grocery opening soon after that in the south half of the building. Peters Grocery sold “everything from thread to harnesses”. 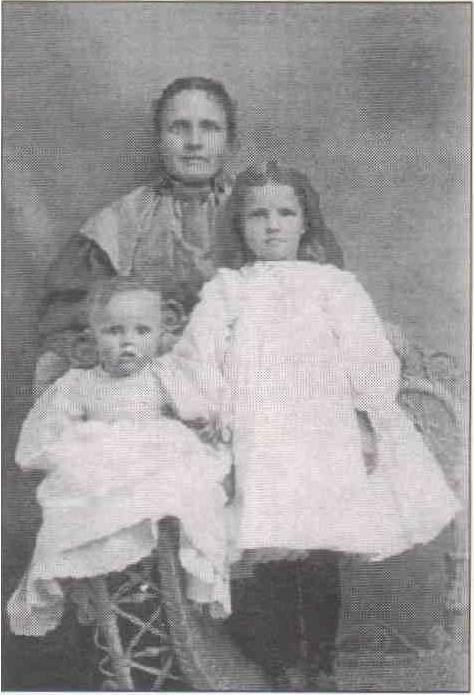 Theresa Lesmeister Peters with two of her children, Henry Hubert, who died in infancy, and Mary Martha, who would eventually become the sole owner of the building that’s now Lesmeister Guesthouse. The Peters Grocery soon needed space to expand and Peters, along with his business partner Ferdinand Spinnenweber, Sr., built and moved to a larger building facing the Pocahontas town square. That building now houses the Randolph County Heritage Museum. The Blissenbach Furniture Store later opened in north half of the Lesmeister building where the Peters Grocery had been previously. In 1925 the building became the property of Mr. Lesmeister’s daughter, Theresa, and her children, the Peters family. In 1945 one of Hubert and Theresa Peters’ daughters, Mary Martha Peters Burke, purchased the building from her siblings. Upon Mrs. Burke’s death the building passed on to her daughter, Mary Frances Burke Brackett. The building was owned by Lesmeister and his descendants for over 100 years. During this time the building housed numerous businesses, including a jewelry store, a furniture store, and in later years a pool hall and entertainment center. The old building finally sat vacant for a few years before Pocahontas native, Dr. Patrick Carroll, purchased the property in February, 2011, to restore it to its 1902 outside appearance as it became the Lesmeister Guesthouse, featuring two vacation rental apartments and three suites, with interior decor and fixtures reminiscent of the 1902 era while offering modern comforts. The Peters and Lesmeister families. From left, Martha Lesmeister, Theresa Lesmeister Peters, Henry Hubert Peters (who died in infancy), Hubert Peters, Mary Martha Peters Burke, Henry Lesmeister (seated), Mary Lesmeister, Kate lesmeister, and “Uncle Frank*”. Inset is Hubert Peters. Information in this report comes from the deed records of the Randolph County Circuit Clerk (Book 27, Page 360; Book 28, Page 254; and Book 59, Page 491), the book “1910 Directory of Randolph County” by L. F. Blankenship, and the book “The Making of Catholic Hill” by Susan Moore Thielemier.